There is something special about bicycles. Any bike enthusiast will tell you that their bicycle is not merely a means of efficient transportation, but practically an extension of their body. But what happens when that once cherished two-wheeled friend has outrun its course? Swedish designer Frida Ottemo Kallstrom resolves this dilemma with unique designs that will keep the cherished memories of your favorite bicycle intact even after its well-worn parts have deteriorated. 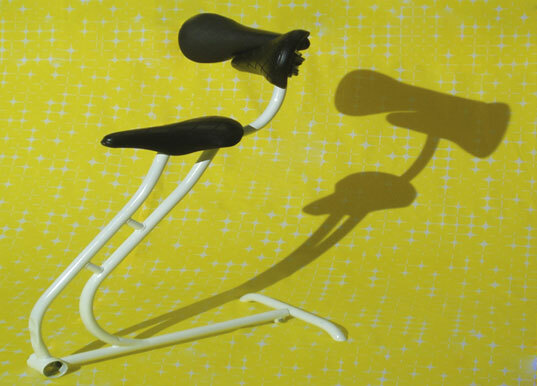 She debuted her collection of recycled bicycle furniture at the Salone Satellite show in Milan this past April. An avid collector of old discarded bicycles, Kallstrom had the idea to convert them into furniture by drawing on the idea of the ‘readymade’. 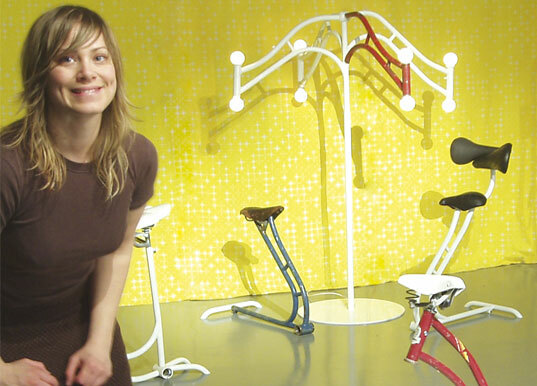 Reconstructing sections such as the mainframe and seat post saddle, Kallstrom’s designs contort and abstract the conventional structure of a bicycle, resulting in a playful series of stools and light fixtures. Her Cykelmöbelprojekt will keep you dreaming about Tour de France long after you’ve finished that exhilarating bike ride home. LIGHTEN UP CRITICS! These stools are beautiful works of art. Purist cyclists will recognize the grace Frida has captured in their rendering, and appreciate them as the finest sort of furniture. A good friend once gave me some good advice about furniture. He said you should always choose furniture that you could sit and appreciate for its form as much as function. I could stare at a bicycle for hours. Whether it's the lines of a sleek new racing bike, or the impossibly slender tubing of a steel frame from the 70's and early 80's, bicycles are beautiful. Frida has created beautiful furniture that engenders speed, whimsy, freedom, and a youthful vigor that some so called cyclists cast aside in their pursuit of faster split times. So Frida, how do I get my own? After having purchased a quality bike at a bike shop, I would argue that taking crappy bicycles out of circulation is doing a favor to anyone who wants to encourage riding. Cheap, poorly constructed bicycles discourage people from riding. I think there is some real potential in the lighting pieces. If you like this, try www.bikefurniture.com. It's miles better! Those who are criticizing this artist clearly do not have enough information. I have owned bicycle shops and am currently active in refurbishing bicycles for continued use. (For example we sent 700 bicycles to the south for Katrina victims. There are thousands upon thousands of bicycle just in my area that are well beyond fixing. I have used many of these in the same fashion as above. I have a hundred in my barn alone. For every five bicycle thrown out one is rideable two are salvageable and two are trash. It is not worthy recycling if $200 worth of time and $150 worth of new parts are required to resuscitate a cheap bicycle that originally cost $99. She is recycling very appropriately. AS for sitting on them, I have some that I have been sitting on for 30 years. They just don't look as nice as hers. Here's a hint: use the wide seats! I use to have a bike a long time ago. I think that is a good way of recycling the materials that are on the bike. that is very neat and cool. Way cool. Repurposing old things should be embraced by our throw-away, one-time-use society. Often when you find an old cruiser with a bent rim, or a busted coaster brake, the parts usually cost more than the bike would be worth once fixed, and even then you're only waiting for something else to go. I've got about 4 junker bikes at my home right now, in addition to the 3 I actually ride for pleasure, and the townie/commuter. For three years I've been casually fixing up old bikes in hopes of getting people to commute on two fewer wheels. It's great to see someone ride away on a recycled bike, but sometimes the machines are too far gone. So for those who say the designer should've fixed the bikes and ridden them, I ask you this: when a bike is too far gone, would you rather see those resources used in a thought provoking and creative way, or go in the dumpster? I work in bicycle recycling orgs. Don't worry about us running out of bikes, there are plenty. We through out most of what is given to us because it is utter crap. Sometimes we use the tubes for something else: furniture, levers, trailers. This person is _not_ wasting anything. But yeah, sitting on a bike saddle at home sounds sorta uncomfortable. I think the floor lamp is aesthestically pleasing, I'd have that in my home. I think it's a great idea overall, it just needs a bit more consideration into the functionality of the pieces. I'd say 99% percent of the discarded bikes I've seen were totally rideable with just a little maintenance. Bent frames and metal fatigue? For anything but a hard-core rider that sort of damage just doesn't happen, unless the bike was driven over with a car. For anything but a hard-core rider that sort of damage wouldn't even matter if it did occur. The problem with this sort of 'design' is that once its novelty wears off it will end up right back in the trash. It's like fashion, too much of a passing thing. Whereas a working bike has utility. And I make very useful things out of old inner tubes (often the only thing on a discard bike that needs replacing), thank you very much. This is a cool project and a necessary one. Not only do many bikes not make it to a refurbishment or parts state, many bikes are so damaged at the end of their useable life (dents, bent frames, metal fatigue) that giving them to a "needy person" to ride is less a gift than an invitation to serious injury. The time and embodied energy - and cost - to make a bike like that rideable is totally impractical. These bikes can't be used as transportation again, and will doubtless end up in the waste stream unless they are re-purposed as furniture or housewares. As a serious cyclist, I can say that I have a bike stool at home, made by youth in a recycle-a-bike program, that I use as my workshop stool. It's lightweight, easy to manuver, and I don't have to worry about trashing it. I understand goal of keeping more used bikes in the flow for folks to ride. Even the most hard-core cyclists have to realize that sometimes, things are no longer useable. Or are all you purists keeping every old inner tube and tire for use as a bungee, just in case? Certainly, this is a better, more creative, more in the environmentalist spirit, less wasteful of material and energy solution than trashing bikes. Neat idea. Perhaps bicycle theives everywhere will finally be deterred. No, not necessarily the most comfortable. Yes, it would be better if the bikes were operable and intimate with otherwise gas guzzling booties. But artists will make their art. At least this woman is not using raw materials. Hopefully she incorporates as much of the bikes as possible into her work. My first thought was, ouch, how long can i seat on those.Impractical it might be, but it was nonetheless an interesting idea. From someone who recycles bikes and has done all levels of repairs to bikes and frames. Some of the above comments are a bit harsh. A huge number of bikes sit in garages, sheds and so forth with owners occasionally getting urges to ride and get fit but cannot sustain their efforts. So there are a lot of bikes in Western society doing squat. There are also a lot of junk bikes around that are thrown out after years of abuse or sitting around in people's garages, sheds and so forth. The owners won't ride them, they may have worn out, could be broken, are junk to start with due to cheap materials and manufactring processes - I wouldn't put in the effort ot repair many bikes I see (even to send some of this junk to a third world country that needs bikes). Expending a lot of energy to repair something that won't last is poor economics. Kona bicycles have a programs of building inexpensive bikes and getting them into third world areas pretty much at cost and those that need them are getting appropriate technology that will last and be servicable. If junk bikes can be recycled into static products, then good! Perhaps seeing this stuff will suit specific needs, then great and maybe somehow just being around these ojects will get a few onto bikes. This is a bit overboard. I agree with Bob, the bikes should be 'recycled' by fixing this. The bicycle seats as seats is way over the edge (not in a good way) and simply uncomfortable and impractical. Ugly, uncomfortable, what could be better? Oh yeah, fixing the bikes instead of ruining them and making them available for people to actually ride again. Encouraging people to ride bikes is a worthwhile pursuit btw. The lamps are pretty cool, but a bike seat isn't exactly a welcoming site after a long day of work. Sandor's bike wheel/pot rack is damned impressive. Cool stuff. I sit on a bike seat a lot, and I can't say that I would want to go home and sit on a bike seat there. I love stuff made from bike parts. I made pot rack out of an old bike wheel.